Hello fellow traders. In this technical blog we’re going to take a quick look at the Elliott Wave charts of DAX, published in members area of the website. As our members know, the Index has incomplete bullish sequence in the cycle from December’s low. The Elliott wave structure has been calling for further strength. 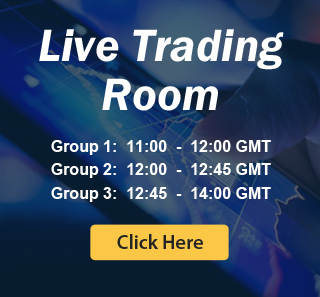 Consequently, we advised members to avoid selling DAX and keep buying the dips in the sequences of 3,7,or 11 swings whenever opportunity presented itself. In further text we’re going to explain Elliott wave structure and trading setup. As we can see on the chart below, DAX is doing wave (B) Blue pull back, that is unfolding as WXY Double Three Elliott Wave pattern. The Index is bullish against the 10865.3 low and we favor the long side. Short term pull back looks incomplete. It’s showing 5 swings, suggesting another swing down toward 11444.85-11341.6 area , where we like to be buyers for proposed rally or 3 wave bounce alternatively. Although we expect to see another leg down , we advise members to avoid selling against the main bullish trend. Strategy is waiting for mentioned area 11444.85-11341.6 to be reached, before entering long positions. As our members know, Blue Boxes are no enemy areas , giving us 85% chance to get a bounce. The main trend is bullish and we expect to see reaction in 3 waves up from the blue box at least. As soon as the bounce reaches 50 fibs against the X red high, we will make long positions risk free and let the profit run. 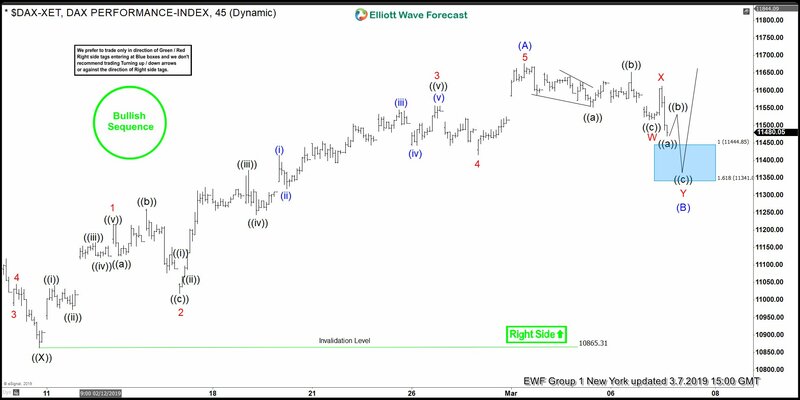 Buyers appeared right at the blue box when Elliott Wave Double Three completed at 11407.3 low. We got expected rally and as a result members are now enjoying profits in risk free positions.Recently we got a new short term high with a break above 03/01 peak, confirming next leg up is in progress. At this stage DAX is bullish against the 11407.3 pivot, suggesting more strength potentially. Now as far as 11407.3 pivot holds, intraday pull backs can find buyers in 3,7,11 swings for proposed rally or 3 wave bounce at least.